Discover and develop your own perspective and ideas within contemporary art. Nurture your creative talent alongside professional artists in our artist community. Graduate with a skill set that meets the needs of employers across the globe. Britain’s creative industries are worth £92 billion, employ 2 million people and are growing twice as fast as the rest of the economy. This course will give you the skills to join this growing industry. The tradition of Art runs deep at Sunderland, but we don’t stand still. We’ve built on this history and experience, adding innovation and modern teaching approaches to create a course that gives our graduates the edge. Our Fine Art team, all working artists, have a wealth of professional practice and subject expertise to help you realise your art aspirations. Guided by these experts you will have the freedom to explore your creative interests across a broad range of Fine Art practice including painting, printmaking, digital photography, film, sound, drawing, sculpture and performance. Working collaboratively, you’ll learn to see the bigger picture and will develop highly adaptable skills, alongside your technical abilities. Throughout the course you’ll work towards live outcomes, building your confidence as an artist to promote yourself, your art and to understand the impact you can have as an artist in society. You’ll be allocated your own studio space from day one. This will be your space to build and develop your creativity alongside fellow students. The first year is all about exploration. You’ll experience a range of working methods, honing and testing your technical, making and artistic ability, while building your studio practice. At the end of the year you’ll show your achievements at your first exhibition. In the second year you’ll start to link your artistic practice with live experiences. You’ll work collaboratively with students from other disciplines in the ‘Integrated Creativity’ module; replicating the practice of some the world’s biggest artists who draw on a range of creative talents. You’ll also start to consider your place in society; how you want to work and where your art can take you. You’ll undertake a project with a live outcome that could be a group exhibition, a workshop in the community or a project with a local school. All of this will also extend your understanding of the creative industries and develop your team working skills, which will be essential for professional life. Your final year is about building your professional practice, skills and experience to prepare you for your Final Degree Show, graduation and beyond. You’ll produce your own book, showing a window into your practice and skills, which will help you promote yourself to employers. Understand what it takes to bid for funding or secure an exhibition space; all before critically selecting your work for public exhibition at your Degree Show. Assessment methods vary between modules. They include studio presentations of artwork, a variety of written projects, and exhibitions. Part-time students study the same course as full-time students. If you study this course on a part-time basis you will typically complete 40-80 credits in a year, rather than the 120 credits of full-time students. All modules are taught during the daytime, and you will be studying alongside full-time students. Start to develop your own personal studio Fine Art practice and exhibit work in the Fine Art Stage One show. 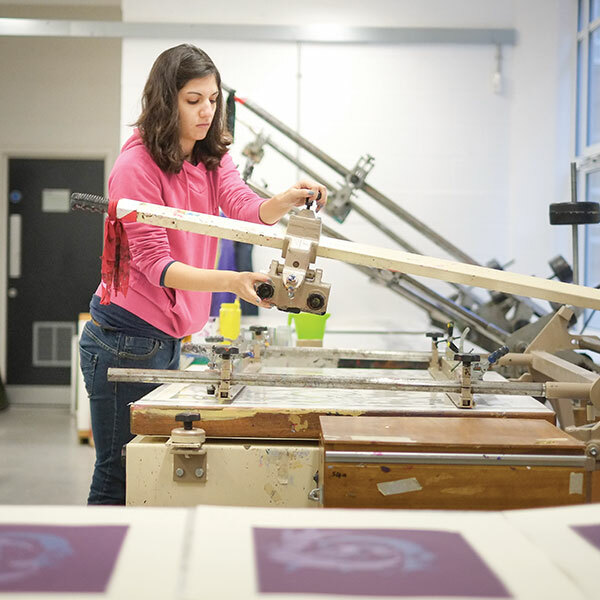 You’ll be allocated your own studio space and have access to printmaking, wood, metal and digital/FabLab workshops. Start to develop your Fine Art practical skills in painting, printmaking, digital photography, sound and sculpture. Get an introduction to drawing principles, engage with diverse approaches to drawing using a wide range of ideas, materials and working methods. Learn about some of the key art movements and ideas which shaped, and continue to shape, the world culturally. Produce and expand your own visual work, and consider the form and the appropriateness of the medium in relation to idea, choosing from Fine Art’s wide area portfolio of subjects; painting, drawing, printmaking, sculpture, digital, performance and installation. Develop your own studio practice towards installing a live exhibition open to a public audience or alternatively research and present a proposal for a participatory arts project. Explore key cultural themes, examine your own ideas about local and global cultural developments and generate discussions about your creative arts practice. Build your team working skills and expand your creativity by collaborating with students from other creative disciplines such as design, graphics, illustration and fashion. Research and produce a self-negotiated project, produce and publish an artist’s online and hard copy ‘Blurb’ art book, which reflects and evaluates your practice. Pursue an individual programme of work for your final exhibition, selecting from drawing, painting, printmaking, sculpture or new media. 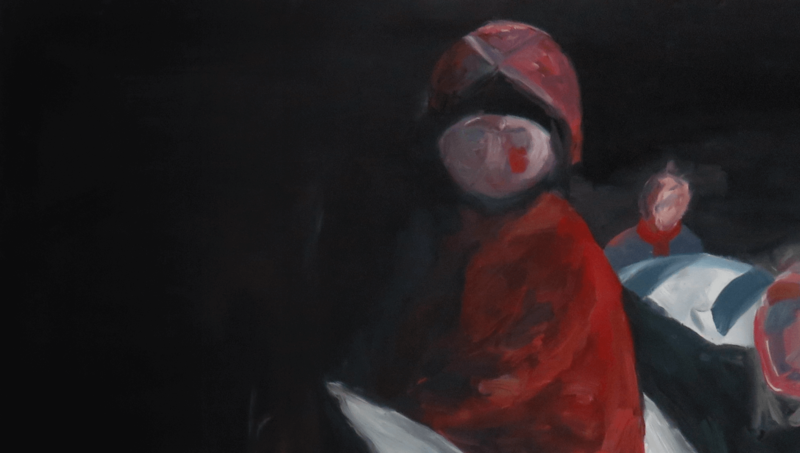 Take a look at our 2018 Fine Art Degree catalogue. This is a self-directed module where you select your own topic of research related to Fine Art or visual culture. The module offers two approaches in the way the research is demonstrated: a 6000-word written dissertation or a 6000-word document which includes a comprehensive arts related career plan outlining your research practice. This also includes preparation for an arts funding body application towards: a curated show, to set up a studio group, community-based activity or public commission. Studio-based practice (where you have your own, personal, studio space) is the core to the Fine Art course and you will be allocated a generous sized individual studio space in Priestman Building. You will also have additional project and exhibition spaces for paintings, prints and sculpture, plus digital installation and performance work, where ideas can be tested, outside of your individual space, providing an effective and discursive learning environment. This includes our own ‘Shaun Project Space’ and ‘Gallery 007’ (our Fine Art, Digital, Photographic, Film, Sound Installation project space) where students can explore new ideas and engage in group discussions about their work. Fine Art students will also have the opportunity to exhibit and gain experiences supporting the installation and curating public exhibitions in our large Faculty Priestman Gallery. You will have access to excellently equipped workshops in printmaking, 3D printing, digital photography, digital sewing and embroidery, woodwork, metalwork and casting as well as support in the development of film and sound. You also have access to FabLab on City Campus. This course is based at the Priestman Building, the main base for art, design and performance on City Campus. Thanks to a major renovation programme, the Priestman Building provides an excellent teaching space and resources as part of a vibrant and creative learning environment. If the above criteria is met you will be asked to attend an interview. For this interview please prepare a portfolio of work, which should be simply mounted and accompanied by preparatory work. Sketchbooks are an important feature of your preparatory work and should be included. Where possible, 3D and large 2D work should be photographed. Digital and screen-based work should be saved on a CD or memory stick. If you are an international applicant, please supply your portfolio on a CD. Working in the creative sector is all about following your passion for originality – using your imagination to develop new ideas and techniques and to challenge the norm. Fine Artists gather skills that are essential to the world of work. Creative thinkers are called for in a range of sectors beyond the Creative Industries thanks to the range of transferable skills. This course is an opportunity for self-development and exploration. We’ll support you to develop your professional practice, build your confidence as an artist to promote yourself, your art, understand the impact you can have on society and explore where your art can take you. To enhance employability, we encourage you to develop a Professional Portfolio throughout your time at the University. This includes an online art blog and art book publication of your work, with an artist statement and a CV; this will be invaluable for promoting your skills to future employers. We aim to prepare you to become a confident professional, with transferable skills. Increasingly, creative workers follow a ‘portfolio’ career comprising a range of roles such as teaching in schools, colleges and universities, artist residencies, creative practitioner and as a practising fine artist. This makes for a really flexible lifestyle enabling you to extend your professional contacts, build your artistic practice and take advantage of opportunities as they arise. Almost half of creative workers are self-employed, compared to 15% across the workforce as a whole and 95% of creative businesses are micro-businesses with less than ten employees according to The Creative Industries Federation, July 2017. This course provides sessions on becoming self-employed and our ‘Creative Lives’ lecture programme offers case studies of creative careers. Destinations for Fine Art graduates also include public arts, curating and other areas within the creative industries. Some of our graduates work as artists and show their work in commercial galleries. Others have gone on to work in museums, galleries and many different types of employment and self-employment. This course will encourage you to consider employment options both in the creative sector as well as in other types of industry. A number of our students have chosen to progress to postgraduate courses such as our well-regarded MA Fine Art course, Teacher Training PGCE, PCET SCITT teacher training programmes. I want my work to have an environmental message, revealing the beauty and frailty of nature. Sunderland had the best studio spaces in which to work in by far. The tutors I worked with were very open-minded and willing to talk through ideas. Sunderland taught me that if you are passionate and really want it, you can make it happen. At Sunderland it was like being part of a wide family.